Kick off your fall semester with a once in a lifetime trip! The backpacking trip is led by an experienced guide and features an unparalleled wilderness experience, breathtaking mountain views, and crystal-clear alpine lakes. Beginner and experienced hikers alike join us as we explore the Bridger-Teton Wilderness in Wyoming for five days. The trip consists of only two days of actual backpacking on relatively easy terrain (no scrambling or really steep portions) to set up and return from a base camp. The other three days will be day hikes from that initial base camp. This allows you to get an experience of backpacking and true wilderness without having to carry a heavy pack the whole time! Our base camp will be located by Big Sandy Lake, which is a scenic lake surrounded by mountains and waterfalls. The first day hike we will do is back to the famous Cirque of the Towers where we will hike to a valley completely surrounded by awe-inspiring mountains. The second day hike will take us off the well-known trails so we can experience complete solitude and see views that barely anyone has seen before! 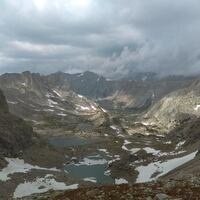 The hike takes us alongside Black Joe Lake up to a portion of the Continental Divide trail. Our last day hike is my personal favorite. It is a more leisurely hike that takes you by four different lakes in the Wind River Range. Connecting the lakes are a series of smaller waterfalls and pristine pools that you walk alongside for a good portion of the hike. The last day back there we will pack up our camp and backpack out to our van to start the drive back home. The registration costs include transportation, equipment, leadership, and meals. Date and time(s): Sat, Aug. 11- Sat, Aug. 18, 7:00 A.M. – 7:00 P.M. If you register before July 11, receive a $50 discount! This trip is at full capacity, to be added to the waitlist please email outdooradventure@niu.edu, thank you.